"Stone Worms - Vermes lapidum, are tiny worms, which grow in sculptured rocks, especially in old buildings and walls they are found. They nibble on the rocks, such as [the rocks] decay like leaves to dust." Definition of the "Stone Worm" according to the "Allgemeines Lexicon der Künste und Wissenschaften" (General dictionary of Arts and Sciences) - first edition of a dictionary published in 1721 by JABLONSKI, J.T., re edited in 1748 by Anonymous. 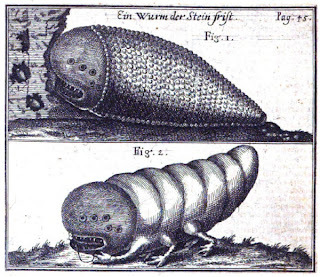 Eberhard Werner Happel "Relationes curiosae, oder Denckwürdigkeiten der Welt" (Curiosities of the world), published in 1683 and 1691 in five volumes, tells the story of the discovery of these strange and terrifying creatures. A monk of a monastery in the Normandie - Mr. de la Voye - found "on an old wall to midday, much of rock eaten by these vermin. The holes were as big, as that a hand could be put within. Such holes were full of living worms and dust, which they made of the rocks.."
"This vermin is enclosed in a grey shell, as depicted in Fig.1., large as a grain of barley...on the tip there is a hole, trough which the excrements can be excreted/ on the other end there is a larger hole, trough which the head can be protruded. They are entirely black, the body shows various segments, near the head there are three legs, each has two joints, not dissimilar to these of a flea. When they move their body is suspended in air, the mouth but is still oriented to the rock. The head is bulky, a bit smooth, similar in shape and colour to the shell of a snail... also the mouth is similar large, with four kinds of teeth disposed in cross like manner.."
Fig.1. A worm that eats rocks. Fig.2. 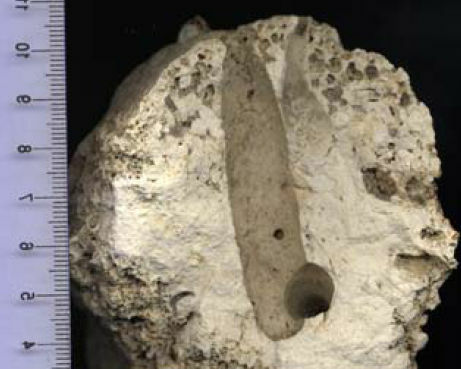 Cross-section of a limestone-pebble of the Adriatic Sea with recent bioerosion and bore holes of Cliona sp. (a sponge), Lithophaga lithophaga and Zirfea sp. (bivalves)... or could this be the terrible results of a Vermes lapidum infestation?